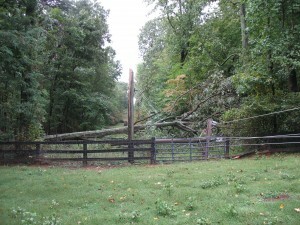 One huge tree, two power poles... Yeah, we're going to be out of power for a while. Thankfully, the lines are high enough across the driveway that we can drive under them without touching anything. The power pole in the first photo missed my new trailer by inches. And Achaosofkittens locked the boys out of the side with the broken fence, so no goats are going to go on walkabout. ETA: The tree-removal guys were here reasonably promptly, and say that they should be done by midnight or so. I chatted them up briefly, and we all agreed that tree removal was much easier to do on a clear, breezy evening at 55 degrees than in ice storms or two feet of snow. but the goats are ok? Sorry about the power outage! The boys were a tad puzzled, but yes, everyone is ok. Thanks for asking! Well, bleep! 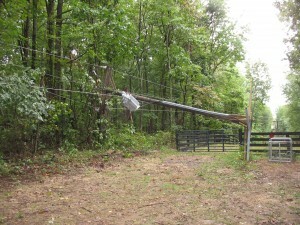 Hope your power gets fixed sooner rather than later. Quite the photo. I'm glad people and goats are okay. I hope power can be restored quickly.